You are currently browsing the category archive for the ‘East Asian Culture’ category. Reforming the university system in S.Korea is a good thing, especially as it relates to research and development; as economic issues have long been on the mind of South Koreans, due to stagnant wages and weak aggregate growth. Technological innovation could lead to Korea developing lucrative specialized niche markets. The underlying problem, as pointed out, is that the same Confucianist work ethnic and respect for hierarchy that helped South Korea develop at such a rapid clip has now brought them to a point of diminishing marginal returns. To reach a higher level they must be creative enough to innovate. “Outside the box” thinking and military style conformity for big “push” initiatives usually do not mix well. This has been a problem in Singapore and Japan in recent years, as both nations have tried to promote creativity and “relax” cultural constraints, to varying success. DAEJEON, South Korea: In Professor Cho Dong Ho’s laboratory at Kaist, South Korea’s top science and technology university, researchers are trying to develop technology that could let you fold a notebook-size electronic display and carry it in your pocket like a handkerchief. It’s too early to say when something like this might be commercially available. But the experiment has already achieved one important breakthrough: it has mobilized professors from eight departments to collaborate on an idea proposed by a student. This arrangement is almost unheard of in South Korea, where the norm is for a senior professor to dictate research projects to his own cloistered team. But it’s only one change afoot at this government-financed university, which has ambitions to transform the culture of South Korean science, and more. 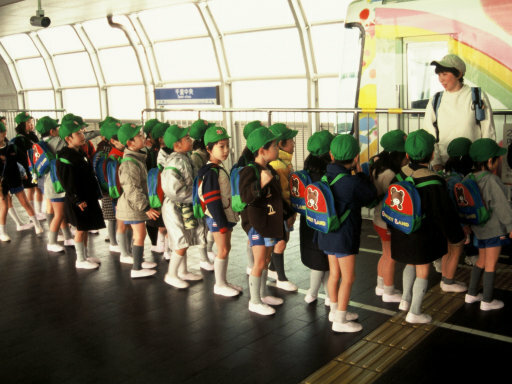 –Desperately seeking students (Japan) – What is interesting about this is that Japan’s government is fully aware of the increasing student shortage and will allow the market to decide which schools stay open. This is something Americans should let happen with HBCUs. –Bloggers push China to prosecute beating death – What is most interesting about this is that the Internet was instrumental in pressuring the government to adhere to the rule of law. This is a powerful tool for public outcry, that despite government efforts; they really can not effectively control. –Asia: ‘Internet forces’ in China and Taiwan step up cyber attacks – Last time it was Chinese hackers attacking South Korea, now it is Taiwan v China. This article is a little different from the one I read on the South Korean attack. It goes into a lot more detail about the nature of the attacks. The United States and German governments also appear concerned as well. The article also mentions that due to security measures Taiwan is less vulnerable to cyber attacks than Japan, the U.S., and EU. –Japan asked China to tone down Nanjing Incident exhibits – This is somewhat shocking to be honest. I have said all I have to say on Japan’s WWII issues here, but I do not think it is wise for Japan to make statements like this. Instead they should demand for a international panel of historians from China, Taiwan, South Korea, and the United States to decides what occurred during WWII and in its aftermath once and for all and have high ranking government representatives sign it and agree to abide by the findings. As I said before I do not think China would ever agree to that, for reasons obvious to me. –West Africa: Food Prices Still Climbing, Crisis Feared – This is not good at all. –Uganda’s Economy Grows By 7% – I found this over at Booker Rising. Apparently, Uganda has discovered more oil. I mused about my concerns, which mainly center around “Dutch Disease“, at Booker. –The East African Standard (Nairobi) – The Kenyan Election Committee Chairman, Samuel Kivuitu, announced that he was pressured to announce the incumbent, Kibaki, as the winner. He is urging the matter to be reviewed by a court and the commission has condemned the violence. There is more background information on what is happening in Kenya here. “‘As unfair judicial rulings exist in many countries, he should deal with this problem via the legal system in his country. We ask that he leave when his trip finishes [today],’ Liu said on Friday.” Basically that means, “we don’t care“. –Vietnam economy grows nearly 8.5 pct in 2007 – More good news on Vietnam’s economy. I’m very impressed by the industrial mix of the economy; agriculture is only 20% of the economy. I also did not know America was their largest export market; followed closely by the EU. Vietnam also has over 20 billion in investment pledges pending. This is outstanding! –Foreign journalists report continued harassment in China – I fully expect this to increase for reasons I outlined previously. The new law is nice, but I doubt they will be widely enforced at a local level. Local officials do not want to lose face before their superiors, especially during the Olympics. I would be a lot of these assaults are due to these officials acting on their own (by the use of plain clothed thugs) to prevent any embarrassing details from leaking out to foreign press. –Japan pledges to help China curb pollution – A lot of confidence building came out of this meet, which was good. I lived in Shanghai and I can tell you about the throat and lung infections from the pollution, all the days that were so dark you could not see the sun, etc. China needs all the help it can get with this. It is a beautifully diverse country and although I think they “have to” go through this industrialization, just as everyone else has, itis good they are taking steps to limited the environmental degradation. For more information on other points discussed check here. On a side note, sometimes people underestimate the power of goodwill programs (i.e. exchange students) to change public perception, but I do not. 3,000 students can saw a lot of thinking at home when they get back. –Taiwan presidential candidate cleared on graft – Told ya so, here. –Shuffled off to history, veneration of Ro Moo Hyun will follow – French plays the requiem for the Roh Administration in South Korea. I’m sorry but I think he overplayed Roh’s statesmanship here, in large part, due to his dislike of the Bush Administration. I’m not a fan of George W. either, but even he was not stupid enough to try military action against a potentially nuclear armed N.Korea when there was so little intelligence and N.Korea could potentially nuke Seoul and Tokyo; especially with so many American troops exposed. Sorry, Mr. French; don’t buy it. It seems the S.Korean people did not either, as they elected the political opposite of Roh. –Nigeria’s graft catcher is sent for training – This is not good; just when I was congratulating Nigeria on its anti-corruption crackdown. Although it is likely Nuhu Ribadu did not go out of his way to “bite the hand that feeds”; any crackdown on corruption is better than none at all. The people know this and that is why he has popular public support. $380 billion in graft is nothing to sneeze at. –Tokyo opposes Taiwan’s UN referendum: Fukuda – This is not shocking coming from a Fukuda Administration. He appears focused on making good relations with America and China; both oppose the referendum. Although I recognize this as the most pragmatic position for all involved I have moral issues with it. I do not understand why Britain and Canada can allow or would allow significant segments of their country to vote for independence and Taiwan, a self governing democracy, can not democratically decide what it wants to do. It makes no difference to me if they voted for independence or voted to seek political unification with China immediately. What matters is they have no choice and countries that pride themselves on democracy and human rights are doing everything they can to smoother their right of self determination. Japan has recently explained that it “does not oppose” the plan to hold a referendum on its bid for a seat in the UN under the name Taiwan, but hopes the referendum will not raise tension in the Taiwan Strait, a senior Ministry of Foreign Affairs (MOFA) official said yesterday. -Turnout is heavy in Kenyan election – Well it is election time in Kenya. I covered the candidate that is expected to win, here a few days ago. It seems to come down to a battle between Kibaki and Odinga; Kibaki being the incumbent establishment candidate of the dominant Kikuya tribe, and Odinga; the up and comer from a less affluent tribal group. Turn out is very high and from earlier reading it seems many people from the various other ethnic groups are tired of the Kikuya running things, but besides that education and the economy seem to be big issues. Whatever happens, I’m glad the vote is being judged “free and fair”. –Japanese PM looks to boost ties through China visit – Well, looks like Fukuda will have a good trip as Beijing seems to approve of him and no major typical issues of “Chinese outrage” are on the table. This usually means that China wants something, like more Japanese investment (as they asked for a few weeks back). China is Japan’s largest trade partner and Japan is China’s largest investor. It seems most of the outstanding issues revolve around economics and military buildups on both sides. Could this be the dawn of new relations? I wouldn’t count on it, but money unites all. 🙂 The capital must flow! –Is the sun setting on Japan’s economic power? : GDP drops to 18th among major nations – This is nominal per capita, not purchasing power parity. Japan is still the second largest economy on earth in terms of GDP. Japanese people are also not poor, PPP is more accurate to measure this. This has to do more with exchange rates. –Asia: Lure of China proves irresistible for Japanese seeking fame and fortune – Maybe relations are getting better, after all. This is a very interesting article, worth the read; especially the last part concerning the Japanese companies problems. –Africa Brings New Financial Frontier to American Investors – This article speaks primarily about African Americans investing in Africa. –Japan to amend textbook accounts of Okinawa suicides -My grandfather served in Okinawa during WWII. He told me stories about Japanese people hiding all over the island (i.e. caves) believing that Americans would eat them, because that is what they were told by the government. The Okinawans would jump in the ocean before surrendering or even stab themselves in the throat. Due to historic discrimination against the Okinawans, due to their “impure” status, many Okinawans believe they were used as cannon fodder. My wife thinks that this is not an example of anti-Okinawan discrimination, as all Japanese were instructed to behave similarly. The main difference is that the war never got to the main islands, where they would have been expected to exercise these instructions; Okinawa actually became a battlefield for Japanese civilians. In any case, I think most Japanese people know about this. It is clear to me that most Japanese people over 30 are aware of this; my wife certainly is and she is no history buff. It is good to acknowledge it formally in history texts though. –Chinese goods transform life in Southeast Asia – Cheap Chinese goods are apparently a benefit to poor Southeast Asian states, despite their low quality. –Government to stop energy subsidies next year – Relying more on the market should help control inflation, at least a little bit. This is always a good thing, as price ceilings and floors are inefficient; basic Econ 101. It is also good to see Vietnam moving away from such intricate state intervention in the market. –Vietnam plans Mekong mega-dam in Laos – Laos wants to become the hydro-capital of Southeast Asia and Vietnam will contract to build it? –Crisis of faith for Catholics in Macao – The article talks about the sharp decline of Catholicism in Macao in the last few years. This is not shocking to me as I have talked about Christianity and China before a few times. Confucianist based societies do not easily mess with Christianity or Abrahamic faiths for that matter. –‘Lust, Caution’ has its way with bourgeois China – I think Mr. French is almost a decade late. Most Chinese people I know buy the bootleg version that is uncensored. He is talking about elites traveling to Hong Kong to see the movie uncensored, meanwhile average people are watching it on their computer and in their home a day after the movie came out in Hong Kong or Taiwan. I think what is new is that people are publicly starting to complain about state censorship. I still have not got a look at Tang Wei this flick!! I am obviously opposed to any government media censorship. –Young population dwindles as birth rate declines – More stats and predictions concerning China’s population demographics. The gist of it is that the Chinese population is aging rapidly, part of this is due to the one-child policy, this trend is likely accelerated by the fact China has a huge gender imbalance which will knock a lot of young men out of the breeding pool. There is more on the gender imbalance issue here. I imagine this will likely put a strain on China’s growth, as the amount of labor will decline fairly fast, while the number of retirees dependent on the state increase. I would assume that China’s challenge is to move into more value added/less labor intensive markets before this occurs. –Class of ’77 has withstood the test of time in China – The greatest generation? They have my vote as I have been privileged enough to meet several people “sent down” during the Cultural Revolution (Wen Ge). Here is an interesting factoid, “The 4.7 percent of test takers who won admission to universities – 273,000 people – became known as the Class of ’77, widely regarded in China as the best and brightest of their time. (By comparison, 58 percent of this year’s 9 million exam takers won university places.)”. My friends mother and a Chinese History professor I had were both part of the class of ’77. After 10 years of oppression at the hands of the state, it must have been an amazing things to be part of; to know that you actually had an opportunity to succeed on merit. The fire in their bellies must have been enormous. It was succeed or go back to hard labor for many; I know it was for the people I know. –Africa: New Cable Promises Faster Internet – If the net spreads the way telephone use has, “Mr. Karuranga is one of an estimated 120 million Africans using phones, up from just 2 million in 1998.” this is positive news indeed. I also like this will be owned and operated by African entities and the fact that coastal nations will serve as nodes for landlocked nations. So far, about half the countries in Africa have signed on (23). This is an interesting story concerning how China’s new openness has given ethnic Koreans (Chaoxian Ren) opportunities to work with North and South Koreans. I knew a Chaoxian girl when I was in Shanghai. She was trying to marry anyone she could to get out of China. I never found out what her father’s business was, but he was wealthy and she promised he would pay anyone who would marry her. I think it was a way for all of them to get eventually get new citizenship. As far as I know, she asked almost all the S.Korean male students, a couple of Japanese, and myself (the only American that was not married at the school). Some interesting notes, Chaoxian ren is used in China for N.Koreans and ethnic Koreans in China, but in Japan the same characters 朝鮮 pronounced Chosen, are consider discriminatory. Before reading this article I was not aware that N.Korea had a significant business presence in China. I met some N.Koreans, while I lived in Shanghai, who owed a restaurant I frequented with the S.Korean students at my school. Very nice and humble people. 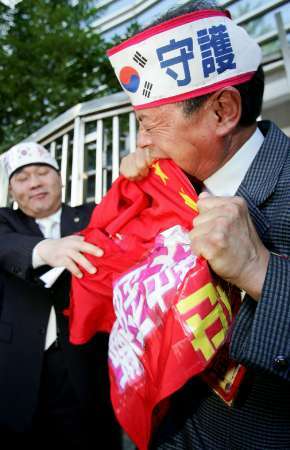 The picture below is of a crazy S.Korean nationalist who eats flags (Chinese, American, Japanese). I always found him funny and I couldn’t find anything better. This is part of a series on ethnic Koreans living in northeast China. BEIJING–When China and South Korea established diplomatic relations in 1992, it transformed the lives of ethnic Koreans living in this country. With South Korean investment pouring into China, ethnic Koreans found themselves serving as a bridge between the two countries. That, in turn, provided a jumping board for them to escape from rural communities in northeastern China, mainly in Jilin, Liaoning and Heilongjiang provinces, for the bright lights of Beijing, Seoul and other cities. Li Yingshu, 52, was managing a small Korean restaurant in Hunchun, near the border with Russia, at the time. The new chapter in relations with South Korea prompted her to move her business to the Chinese capital.